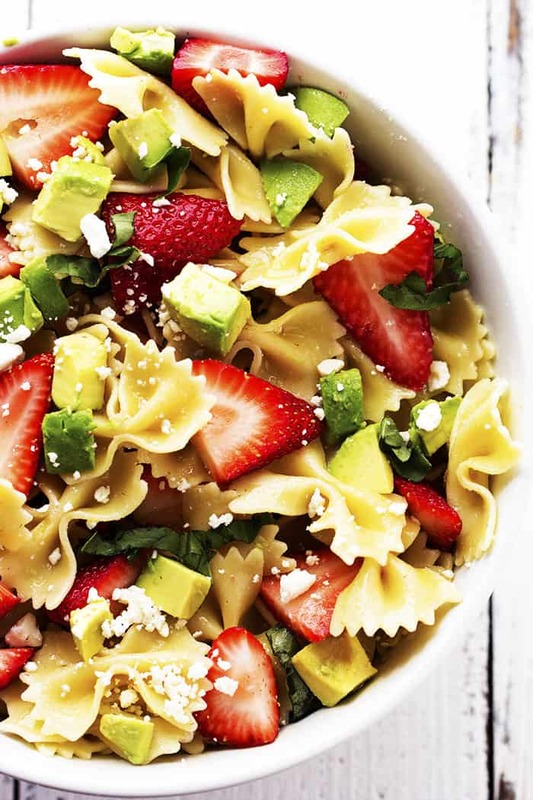 Delicious ripe strawberries come together with creamy avocados, basil, and feta cheese making one unforgettable salad! 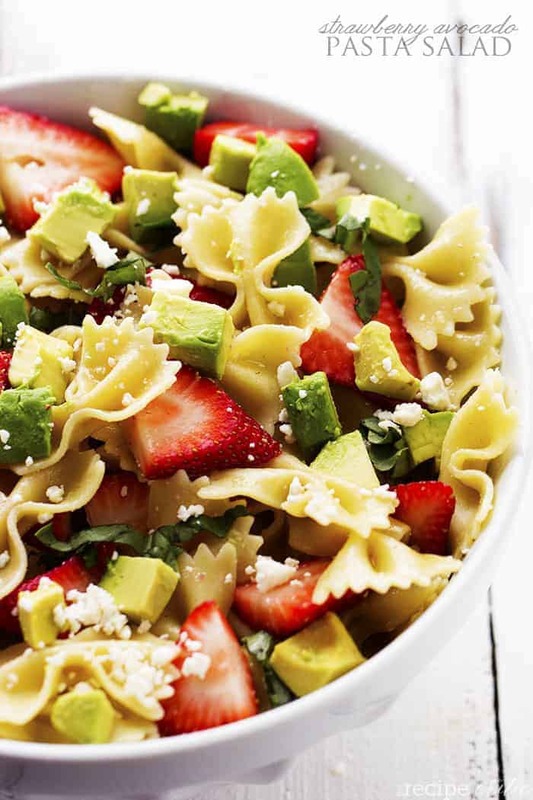 The pasta adds a new and delicious texture and makes this salad perfect and unique! You guys. Strawberries are looking pretty amazing right now! I have been stocking up from Costco because I love them so much. I even got some from my local grocery store last week and they were perfectly sweet and plump. I love making recipes that include strawberries. They are my favorite. As a food blogger your life revolves around food. Which isn’t always a bad thing right? 😉 Well when I was thinking of a recipe to make, I decided to combine some of my favorites. 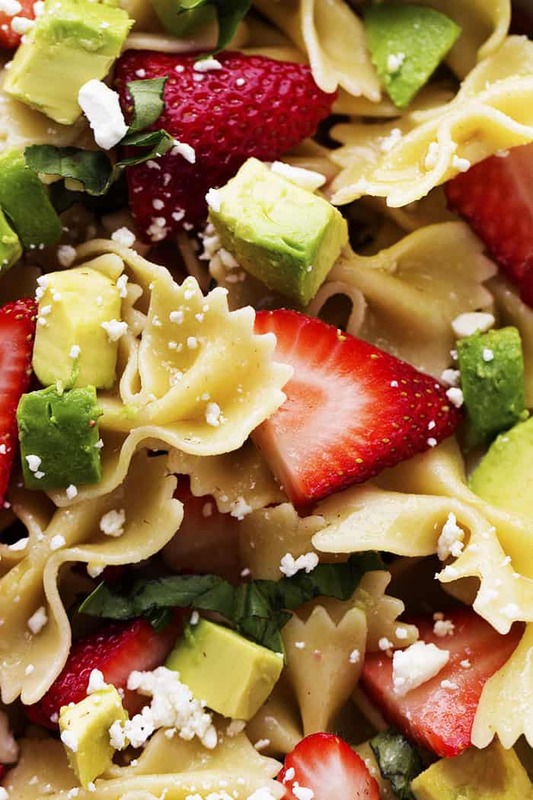 I LOVE the combination of strawberries and avocados. Avocados are so versatile and can be partnered up with quite a few things. But I especially love it with strawberries. One of my favorite salads actually is this Strawberry Avocado Spinach Salad. So I paired up the two again and added it with my other favorites. Basil, feta cheese and pasta. The pasta added such a delicious texture to this salad. The result was absolutely fantastic. You guys are going to love this salad. Wherever you take this it will be a hit! So many delicious flavors and textures in this salad and it is tossed in a light lemon olive oil glaze. Super simple but it adds a light flavor to this already delicious salad. This salad is perfect for the warmer weather ahead and I know you will love it as much as we did! Cook the pasta according to package directions. Rinse and set aside. 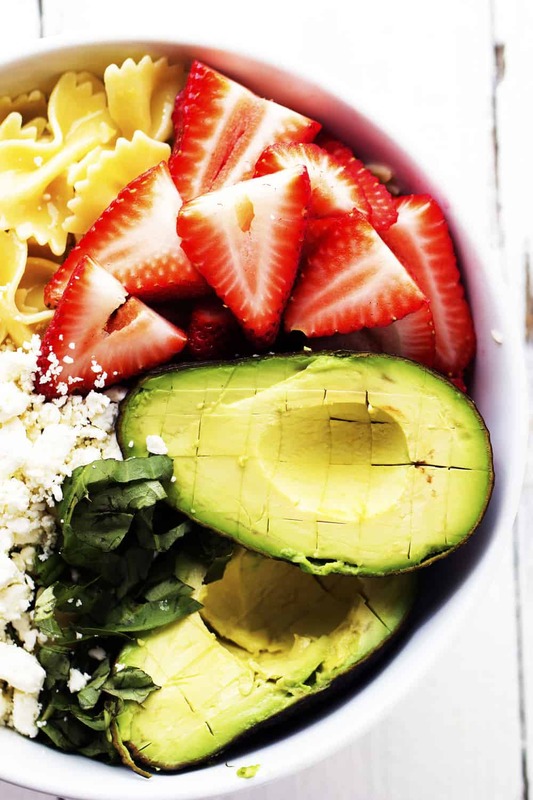 In a large bowl combine the strawberries, avocados, basil, lemon juice, and olive oil. This sounds delicious, but I’m curious what the fridge shelf life is? My concern is that it’s too much for my family of three and I wonder about the avocados turning brown…or does the lemon juice solve this potential problem?? Thanks! My family love salads and I definitely will be trying your delicious recipes. Thank you for sharing. I’m impressed! I, too, love Cooling, Recipes, Experimenting with Recipes, & pleasing the pallets of my family & friends.